The minute I got up this morning, I was set upon by flies. Abby and the dogs, who’d gotten up an hour before, were already fighting them. Between spraying windowsills and swatting about 20 of them, we got them down below the hyper annoying level. I then recalled a complicated, vivid dream in which Abby and I were on the road near Page, Arizona when we were invited to photograph the replacement of the roof of a haunted house that was actually a mountain. I climbed to the top and she stayed at the bottom. Hundreds of workers from India joined us. On cue, explosives were set off, creating and avalanche of stone shingles. The first two frames I shot were good, but the rest were overexposed. End of dream. By midday we were both hungry, so I made Abby some hobo potatoes and roasted squash, a favorite of ours this summer when cooking out. 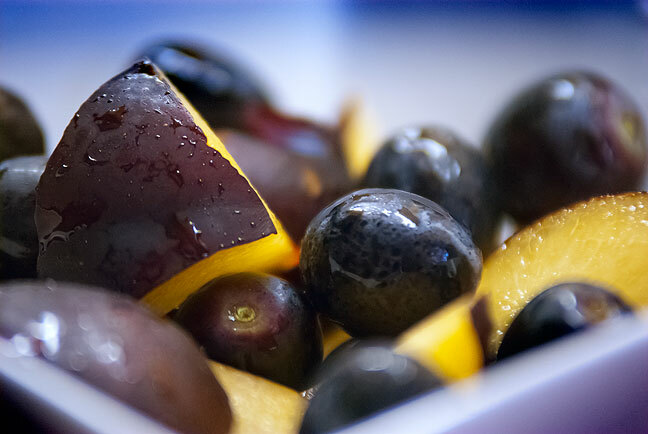 I also made a fruit salad for myself of black plums and black grapes, which I simply call black salad. I’ve always liked these bold flavors, and it was fantastic. Abby and I have a few more chores to accomplish today, and I am teaching tonight. Though not actually the color black, both these plums and grapes are called black. Their flavor was amazing. Did something die in your house? Flies have been at near-saturation level in our neighborhood as well. I blame it on the deluge of dog poop and unbagged trash that’s so common here. In our yard, they are less, partly because I kill them religiously and partly because we have at least two frogs in our yard that eat them. Flies were a terrible problem post-Katrina for at least a couple of years, as I recall. Nowadays, things are fine, unless, as Wil mentioned, we wait even one “session” before picking up the dog’s droppings. Tracey hates them and has bug spray stationed in every room, which *I* hate because I fear guests will think we’re that kind of family where the house looks clean, but in reality it’s crawling with vermin.